Caroline John, best known as Liz Shaw on Doctor Who, passed on 5 June 2012 at the age of 72. The cause was cancer. Caroline John was born on 19 September 1940 in York. She trained at the Central School of Speech and Drama. She would later work with both the Royal Shakespeare Theatre and the National Theatre. She made her film debut in 1955 in Raising a Riot. In the Sixties she appeared in the film The King's Breakfast (1963). She guest starred on the TV shows Teletale and The Power Game. It was in 1969 that Caroline John joined the cast of Doctor Who as The Doctor's companion Liz Shaw. She remained with the show until 1970. Later Miss John returned as Dr. Shaw in the 1983 Doctor Who episode "The Five Doctors." 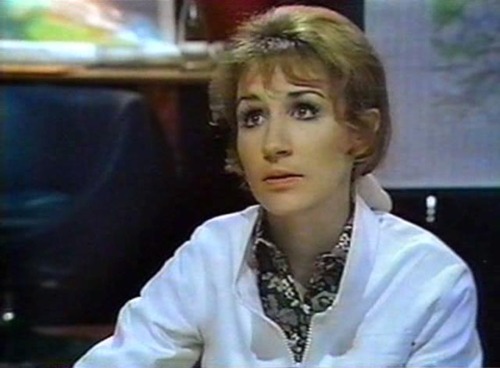 In the Seventies Caroline John appeared on such shows as Z Cars, Love Story, and Crown Court. She appeared in the film Assassin (1973). In the Eighties she appeared in such shows as The Bill, A Dorothy L. Sayers Mystery, A Perfect Spy, Dramarama, Casualty, and Chancer. She was a regular on the shows Wish Me Luck and Harry Enfield's Television Programme. She appeared in the films The Razor's Edge (1983), Santa Claus (1985), and Link (1985). From the Nineties into the Naughts, Caroline John appeared on such shows as The House of Elliot, EastEnders, Silent Witness, Midsomer Murders, and Vital Signs. She appeared in the film Love Actually (2003). Caroline John whose experience on stage allowed her to make the role of Dr. Liz Shaw on Doctor Who very convincing, even in the show's most out of the world episodes. Miss John played Liz as intelligent, independent, and a very skilled scientist (she had degrees in physics and medicine). Miss John also gave performances in very nearly every role in which she was ever cast. Even had she not been cast as one of The Doctor's companions, she would be an actress who would be remembered. Bob Welch, one time guitarist with Fleetwood Mac and a successful solo artist, passed on 7 June at the age of 65 or 66. The cause was a self inflicted gunshot wound. Bob Welch was born in Los Angeles, California on 31 August, 1945 or 31 July 1946 (the date varied from source to source). His father was film and TV producer Robert L. Welch. Bob Welch learned clarinet as a child and as a young teen switched to playing guitar. After his graduation from high school he went to Paris with the intention of attending the University of Paris, although he spent little time on his studies. He later returned to Los Angeles where he studied French at the University of California-Los Angeles. He dropped out of UCLA and joined the vocal group The Seven Souls as their guitarist in 1964. The Seven Souls would see little success, although their song "I Still Love You (B-side of the single "I'm No Stranger")" would become a Northern Soul standard. The Seven Souls broke up in 1969. Afterwards he moved to Paris where he founded the trio Head West. Head West would not prove to be a success. It was in 1971 that Bob Welch was invited to join Fleetwood Mac, who had just lost founding members Peter Green and Jeremy Spencer, both guitarists. Future Games, released in 1971, was the first Fleetwood Mac album on which Bob Welch played guitar. He wrote the album's title track and another song on the album, as well as co-wrote one other with the rest of the band. Bob Welch would remain with Fleetwood Mac for the albums Bare Trees and Mystery to Me, and Heroes Are Hard to Find. In 1974 Bob Welch left Fleetwood Mac. Bob Welch returned to Paris and formed the band Paris with Glenn Cornick (formerly of Jethro Tull) and Thom Mooney (formerly of Nazz). Paris released two albums, Paris in 1976 and, after Hunt Sales replaced Thom Mooney, Big Town, 2061 later in 1976. Neither of Paris' albums were successful. Paris broke up before a planned third album could be recorded. It was in 1977 that Bob Welch released his first solo album, French Kiss. The album would produce two hit songs, "Ebony Eyes" and "Sentimental Lady." French Kiss itself went to #12 on the United States album chart. In 1979 he followed French Kiss up with Three Hearts, which produced the hit song "Precious Love." Three Hearts peaked at #20 on the U.S. album charts. Unfortunately, Mr. Welch's following solo albums would decline in sales. The Other One (1979), Man Overboard (1980), Bob Welch (1981), and Eye Contact (1983) did not even reach the top 100 of the U.S. albums chart. Unfortunately, as his career went into decline Bob Welch developed a heroin addiction. Once he had recovered from his addiction, Mr. Welch stopped performing and concentrated on his songwriting instead. It was in 1999 that he returned to recording, with the album Bob Welch Looks at Bop. He would follow this with two albums that combined the songs he wrote for Fleetwood Mac with new material, His Fleetwood Mac Years and Beyond in 2003 and His Fleetwood Mac Years and Beyond 2 in 2006. Bob Welch was a remarkable guitarist and songwriter who had a large part in changing the direction of Fleetwood Mac from blues to a more pop oriented song. It was largely because of Bob Welch and Christine McVie that Fleetwood Mac would evolve the sound for which it is best known. Although he left the band in 1974, it is likely that had he not joined Fleetwood Mac, they might never have recorded an album like Rumours. Although his solo success would be short lived, during his solo career he produced a good number of remarkable songs. While Bob Welch may have never achieved the phenomenal success that his former band Fleetwood Mac did, arguably he was responsible in part for that success and he contributed a number of great songs in his solo career. British comic actor and film star Victor Spinetti passed on 18 June 2012 at the age of 82. The cause was prostate cancer. He may be best known for his appearances in The Beatles' films A Hard Day's Night (1964) and Help! (1965), as well as their 1967 television special Magical Mystery Tour. Victor Spinetti was born Vittorio Spinetti on 2 September 1929 in Abergavenny, Monmouthshire, Wales. His father was descended of an Italian immigrant who found work in the coal mines in Wales. His mother was a native Welshwoman. His parents operated a chip shop in Cwm, Blaenau Gwent, Wales. Mr. Spinetti attended Monmouth School in Monmouth, Monmouthshire, Wales. He studied at the Royal Welsh College of Music and Drama. Victor Spinetti made his debut on the West End of London in Expresso Bongo in 1958, playing four different roles. He made his television debut in 1958 in Behind the Mask. He made his debut on Broadway in New York City in 1960 in The Hostage. Mr. Spinetti appeared in the films The Gentle Terror (1961), Sparrows Can't Sing (1963), The Wild Affair (1963), and Becket (1964). He appeared on television in episodes of the TV shows Richard the Lionhearted and The Saint. In 1963 Victor Spinetti was appearing on the West End in the satire Oh What a Lovely War. It was one night that two members of The Beatles (already popular in the United Kingdom, but not yet having conquered the United States), John Lennon and George Harrison, visited him backstage. George Harrison told Victor Spinetti that he had to be in The Beatles' film (what would become A Hard Day's Night), all of The Beatles' films. Curious, Victor Spinetti asked, "Why?" George Harrison simply replied, "Because if you’re not in them, me mum won’t come and see them. She fancies you." As a result Victor Spinetti appeared in A Hard Day's Night as the neurotic television director in charge of the programme on which The Beatles were appearing in the film. 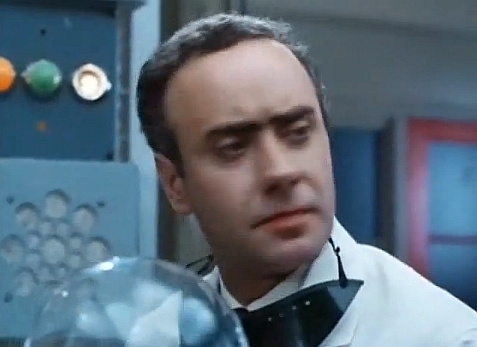 Victor Spinetti would also appear in The Beatles' second film Help! There he played the mad scientist Foot, desperate to steal the sacrificial ring stuck on Ringo's finger ("With a ring like that I could - dare I say it? - rule the world!"). With his appearance in The Beatles' 1967 television special Magical Mystery Tour, he became the only person besides The Beatles to appear in A Hard Day's Night, Help!, and Magical Mystery Tour. Victor Spinetti would remain friends with The Beatles well after Magical Mystery Tour had aired. In the Sixties Victor Spintetti also appeared in the films The Taming of the Shrew (1967), The Biggest Bundle of Them All (1968), Can Heironymus Merkin Ever Forget Mercy Humppe and Find True Happiness? (1969) . Start the Revolution Without Me (1970), This, That and the Other! (1970), and Defeat of the Mafia (1970). He appeared on television in an episode of Thirty-Minute Theatre. He was a regular on the TV show Two in Clover. He appeared on the West End in Oh What a Lovely War (1963) and appeared in the show when it debuted on Broadway in 1964. He also appeared on Broadway in La Grosse Valise (1965). In the Seventies Victor Spinetti was a regular on the TV shows Take My Wife and Kelly Moneith. He guest starred on the shows Harriet's Back in Town, Cooper, Bernie, and Time of My Life. He appeared in the films Under Milk Wood (1972), Digby, the Biggest Dog in the World (1973), The Great McGonagall (1974), The Little Prince (1974), The Return of the Pink Panther (1975), Voyage of the Damned (1976), Some Like It Cool (1977), and Fiona (1977). In the Eighites Mr. Spinetti was a regular on the TV programme Sweet Sixteen and provided the voice of Texas Pete on the animated series SuperTed. He guest starred on the TV shows BBC Play of the Month, Bad Boyes, and Omnibus. He appeared in the mini-series Mistral's Daughter and Sins. He appeared in the films Under the Cherry Moon (1986) and The Krays (1990). In the Nineties he was a regular on the TV show An Actor's Life for Me. From the Nineties into the Naughts he guest starred on the shows Paul Merton: The Series, Take Off with T-Bag, Bottom, The Adventures of Young Indiana Jones, First Degree, New Tricks, and High Hopes. He appeared in the films Julie and the Cadillacs (1999), Wednesday (2006), and Cosa raccomanda lei? (2006). Victor Spinetti was one of the best comic actors to emerge out of the United Kingdom in the late 20th Century. He had a fantastic wit and he was a master of the English language. At the same time he was very adept at physical comedy. These talents suited him very well, as he easily handled material ranging from The Beatles' films to Shakespeare's comedies to such broad family movies as Digby, the Biggest Dog in the World (1973). Although Victor Spinetti was perfect for comedy, he could also play dramatic roles as well. He gave excellent performances in both the film Voyage of the Damned and the television movie The Attic: The Hiding of Anne Frank. In interviews Victor Spinetti was a great raconteur. By all reports he was also a very warm hearted man. He appeared at many Beatles conventions around the world where he told stories about the making of A Hard Day's Night and Help!, as well as his friendship with The Beatles. Mr. Spinetti was always patient with my fellow Beatles fans and always had kind words for them. Indeed, when he was on Broadway in Oh What A Lovely War he told those Beatles fans who attended to see him that if they behaved he could sit in the front row after the play and he would tell them about The Beatles for 10 minutes. Victor Spinetti did so for the rest of his time with the play. Not many actors would be so kind to take time out to talk to fans of a popular musical group about his experience with them! In the end Victor Spinetti was not just a great comic talent, he was a fine Welsh gentleman. Actress Kathryn Jootsen, who was a regular on The West Wing and Desperate Housewives, died 2 June 2012 at the age of 72. The cause was lung cancer. Miss Jootsen was born on 20 December 1939 in Chicago, Illinois. She worked as a psychiatric nurse at a hospital there. She had two sons and raised a family. She divorced her husband in 1980 and did not decide to take up acting until she was 42 years old. Kathryn Jootsen made her film debut in Grandview, U.S.A. (1984). In the Eighties she appeared in the shows Sable and Lady Blue. She appeared in the film The Package (1989). In the Nineties she appeared on such shows as Picket Fences, Chicago Hope, Grace Under Fire, 3rd Rock From the Sun, E.R., Roseanne, Murphy Brown, Frasier, Seinfeld, N.Y.P.D. Blue, The Nanny, and Home Improvement. She appeared in the films Eating Las Vegas (1997), Phoenix (1998), and Kiss Toledo Goodbye (1999). In the Naughts she was a regular on The West Wing, Joan of Arcadia, and Desperate Housewives. She appeared on such shows as Dharma & Greg, Spin City, The X-Files, The Drew Carey Show, Charmed, The King of Queens, Will & Grace, Everwood, My Name is Earl, Monk, and Scrubs. She appeared in such films as Wasabi Tuna (2003), Red Roses and Petrol (2003), Breaking Dawn (2004), Hostage (2005), Taking Your Life (2005), Wedding Crashers (2005), and Cheaper by the Dozen (2005).